Good news for milfoil management in Lake Minnetonka – we have taken another positive step to provide more comprehensive control of Eurasian watermilfoil. As many already know, milfoil has been in Lake Minnetonka for 20 years. As well, we all know what problems milfoil has caused – dense mats impeding recreation, diminished fish and wildlife habitat, fragments washing up on shore and even safety hazards. This summer milfoil is particularly bad. Now, another critical step to better control milfoil has begun. Following the success of the 2006 milfoil demonstration project, the Lake Minnetonka Association and the Lake Minnetonka Conservation District have begun the process of developing a Lake Vegetation Management Plan, or LVMP, for three bays – Carman’s, Gray’s and Phelp’s. This plan is a formal document recognized by the Minnesota Department of Natural Resources as a way to control milfoil outside of the normal permit restrictions. Rules and restrictions for controlling nuisance plants were developed at a time when exotic plants, like milfoil, were not in Minnesota lakes. Because native plants are beneficial to lake health, controlling or removing these plants was allowed, but only in small areas and only to facilitate access or recreation. These restrictions were reasonable and most people easily worked within them. The game changed with the introduction of exotic plants. Now, exotic plants not only create greater nuisances in larger areas, they also cause harm to lake ecosystems by displacing native plants and the fish and wildlife that need these good plants. So, the existing restrictions are sometimes impediments to the sound management of the lake. Two recent developments allow better, more comprehensive plant management of milfoil and other exotic plants – the development of management tools that target the exotic plants while protecting native plants, plus the LVMP process which can allow variance to the existing plant management rules and restrictions. The 2006 milfoil demonstration project is an example of a management tool that was used to target milfoil and protect native plants. In that project, three herbicides were applied to three areas in Lake Minnetonka which resulted in effective milfoil control without harming native plants. Tools like this can now be considered for wider application. Developing an LVMP is the next logical step to consider the use of these tools in a comprehensive manner. The LVMP will contain three key elements. The first element is a physical inventory of the plants in the three bays. The Army Corps of Engineers, recognized nationally for their expertise in aquatic plant management, have agreed to conduct the plant inventory at no cost to the local agencies. The second element is a stakeholder analysis. Here, a cross section of stakeholders will be involved by giving input regarding what they see as problematic about milfoil or other plants, helping to define appropriate management goals and objectives and supporting future control programs. The third element is developing a plan that meets the needs of the stakeholders. The planning process will be completed in time for implementation in 2008. Successfully completing the LVMP for the three bays will put the Lake Minnetonka Association and other agencies and interest groups in a strong position to continue this effort for the entire lake. Why not prepare a plan for the whole lake? The main reason we could not consider developing a plan for the entire lake is a lack of funding. The Lake Minnetonka Association believes a thoughtful, comprehensive plan will be beneficial for lake health as well as leading to better, more effective milfoil control. Interested people can help pave the way for more planning and management attention by urging our elected leaders and contributing financial support. Public participation and input is critical to the success of developing the LVMP. Please contact me if you would like more information. Thanks for all of your work on this post. Some people believe the Muskie population benefits from the milfoil. This is probably only a temporary benefit. 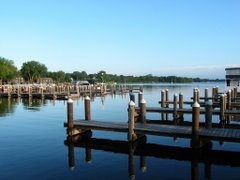 I took the liberty of linking to it from my post at http://www.realestatetwincities.net/minnesota-lakes-and-fishing/. I hope that is ok.